A touring digital exhibition showcasing the past, present and future of Tamworth Assembly Rooms has moved to its next location in the town. The exhibition features old photographs, memories, press cuttings, flyers and historic architect drawings, as well as ambitious redevelopment plans for the iconic theatre’s future. Members of the public are invited to view the display, which is stored on a tablet, as it tours the town, and share their own memories of the building at the heart of the community. 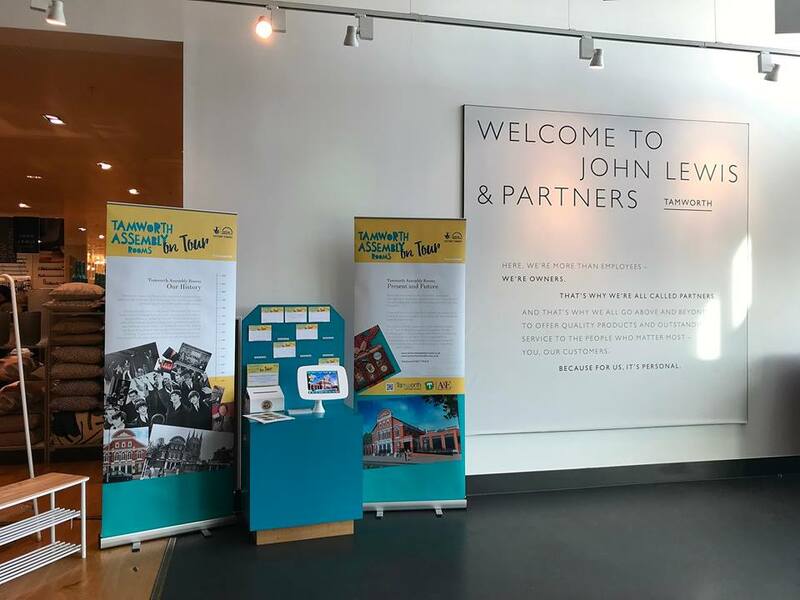 The exhibition has toured a variety of venues since October and has now moved to John Lewis Tamworth at Ventura Park where it will remain throughout February. The collection of stories, photographs, interesting historic facts and interviews with key people on the local music scene, have been brought together to celebrate the building’s past 130 years as it prepares for an exciting future entertaining audiences for generations to come. People viewing the exhibition can read about significant events from Assembly Rooms’ history, including the early days, its role in the war years, those legendary performances by The Beatles and The Rolling Stones, royal celebrations, parades, parties, shows, dances, Battle of the Bands, beer festivals and memories of Tamworth Arts Club and the Hastilow Drama Festival. Tamworth Assembly Rooms was first proposed in 1887 as a fitting monument to mark the Golden Jubilee of Queen Victoria. Councillors turned to the people of Tamworth to help fund the building and the £5,500 needed was raised. The theatre was officially opened two years later on October 8, 1889, by the Tamworth MP Philip Muntz. Since then the building has entertained, hosted, wined and dined, with a huge variety of artists and performers gracing its stage over the decades. It is currently undergoing its most significant refurbishment to date, with a multi-million pound project to extend, modernise and improve the building. We also want to hear people’s memories of the theatre and would be interested to see any memorabilia, such as tickets, programmes or photographs. Anyone who would like to take part can contact Jody Ross via email at Jody-Ross@tamworth.gov.uk. The digital exhibition project is supported by the Heritage Lottery Fund. The Assembly Rooms refurbishment is part of the wider Enterprise Quarter project, which is a joint initiative between Tamworth Borough Council and Staffordshire County Council. The overall £6.1million scheme includes the creation of Tamworth Enterprise Centre, which opened in July 2017, a new restaurant in the Carnegie Centre and the development of new ‘public realm’ open space. It is funded by the Staffordshire and Stoke on Trent LEP’s Single Local Growth Fund (£2.95m), the Heritage Lottery Fund (£903,400), Arts Council England (£365,000) and the remainder from Tamworth Borough Council. You can follow the progress of the Tamworth Assembly Rooms redevelopment via a dedicated blog at www.tamworthartsandevents.co.uk, where you can also sign up to receive all the latest news, offers and information.